With China now one of the world’s economy and industry powerhouses , it is only a matter of time before the world turns its attention to China’s automotive industry. Last year, China recorded a total purchase of 17.2 million cars, compared to 11.2 million cars purchased in the United States, making China the biggest car market in the world. Automotive industry in China has grown in leaps and bounds in the last couple of decades, and Geely has established itself as one of China’s top ten carmakers. At present, Geely is ranked number eight with 3.7 percent market share. Geely Automobile Holdings Limited started off as an independent firm way back in 1986 and launched its automotive manufacturing business in 1997. Geely made a mark in international media especially following the company’s bold move of acquiring Ford’s flagging Volvo line in 2009. Geely also is seen, at least by the Chinese, as one of the strong contenders for competing against car manufacturers from Japan and Korea. At present, Geely has three main brand names: Emgrand, Englon and Gleagle or Geely Panda. 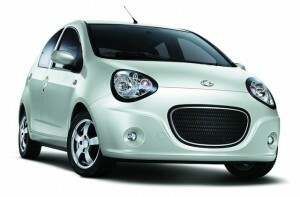 Emgrand targets middle level customers, and the US$ 14,355 Emgrand EC7 is the Geely’s best selling product to date. The company, whose headquarter is in Hangzhou, China, has offices in CIS, Middle East, Africa, Southeast Asia, and Central and South America, besides oversea assembling plants in Ukraine and Russia to produce vehicles in SKD/CKD. With close to 15 million Geely cars roaming the streets, Geely is creating an even stiffer competition with other Asian carmakers, especially with America’s car industry still not returning to its glory days following the 2008 crisis. Geely’s acquisition of Volvo may be seen as an effort by the company to enter American market. Even though many Americans are already very familiar with Volvo, only 15 percent of Americans consider buying a Volvo. Despite the fact that Volvo is losing its trademark safety-plus persona with more and more of today’s cars putting safety on the top lists of the cars’ engaging features, people still see Volvo as their ideal vehicles synonymous with security and reliability. Realizing the trend, Geely is hard at work providing more comfort that features touches of luxury in new Volvos, aiming to win, especially, a bigger slice of Chinese market for comfortable sedans. So, despite continuing to lag behind BMW or Audi, Volvo is set to reach higher sales number by 2013 when Geely is releasing a new Volvo into the Chinese market. One of Geely’s newest products, Emgrand EC-6 RV, may win the hearts of many urbanites looking for a city car that suits their needs and styles. Emgrand EC-6 RV very much copies the design of BMW’s Mini Cooper; yet, upon a closer inspection one can see that the company is offering much more than a simple copied-from product, including G-Netlink telematics, CAN bus technology and smart key, with the options of 6-speed manual transmission and dual clutch transmission for the automatic version. Also interesting to note about the company is its effort in developing automotive industry in China, through education. Geely Group has invested billions of yuan for the establishment of Beijing Geely University, Geely Sanya College of Hainan University, Zhejiang Automotive Vocational College and Zhejiang Institute of Automotive Engineering. These institutions have a total of more than 40,000 students. Each year, more than 10,000 graduates are recruited for jobs in the country’s auto industry, including at eight main production plants owned by Geely in China alone. What one can see from this is the seriousness a company has in ensuring a future for the industry the company is in. The human resources that Geely has endeavored in developing will lead to a better performance. And in the industry where innovation and staying in touch with the needs of the customers is a must, Geely cannot stay put seeing other Asian carmakers and those in Europe going all out in a battle to come up with the most applicable green technology in their products. Correspondingly, Geely has developed hybrid-powered cars and electric cars although they are still in concept stages. By Gandi Faisal. Published in The Jakarta Globe on July 22, 2011.